After reading Talbot Davis’s post on “The Five Things Methodists Can Learn From Independent Churches,” I think it needs to be said that: “correlation does not imply causation.” As United Methodists continue to worry about a lack of quantitative success, as judged by worldly standards of bigger and more, I understand the temptation to look at other churches that seem more successful. It is natural to ask questions like: What are they doing better than us? Why are they having apparent success? The danger of doing this though is that “correlation does not imply causation.” We might be able to show a relationship between the various practices of independent churches and their perceived success, but to say that any one practice (or five) is (are) the sources of that success is deeply problematic. In an introductory statistics class, the teacher will often use the example of ice cream and drowning to show that “correlation does not imply causation.” You can show a statistical correlation between eating ice cream and drowning. Eating ice cream though does not cause people to drown. The relationship between the two is an increase in ice cream consumption and water related activities that takes place during the summer. There is no way to say for sure that any of the five points of the blog post are really the reasons for the apparent successes of these independent churches. When I look at mega-churches such as Northpoint, Willow Creek, or even the United Methodist Church of the Resurrection, I would place most of the responsibility for the success of those churches on the shoulders of their founding pastors. Founding being a key word. Most pastors are not Andy Stanley, Bill Hybels, or Adam Hamilton. Not in the same league in terms of gifts, graces, or fruit. The churches they founded and pastor are not the norm. They might not even be healthy. Will the churches be able to survive and thrive without their founding pastors? Is their ministry sustainable in the long run? This leads to the larger question of what should be considered success for United Methodists? If our purpose is to make disciples of Jesus Christ for the transformation of the world, is the independent mega-church model something we want to emulate? Is this a model of church that offers us a future with hope. Will trying to emulate these churches produce the fruits of discipleship that we are looking for? As United Methodists, I do not think it is in our best interest to copy other churches or even the models of ministry of our mega-churches. Instead, I believe we need to return to our roots by articulating a powerful driving theology of salvation, creating invitational environments for people to encounter Christ, creating environments for people to choose Jesus, and ultimately create environments where disciples can work on their salvation. All of this is contextual. It will look different in every church. We should use our connection for maximum advantage in developing these environments, by the grace of God, but one size fits all programs will not work. When a congregation grows, we may not want to continue the mega-church trend of bigger and larger. Instead of building larger church facilities, we should consider planting new congregations. Correlation does not imply causation. Copying what we think works in independent churches will not necessarily produce success. I contend we need to consider looking to our past and spend time dreaming and discerning. Remembering our roots and praying for how God might be calling us to be a Wesleyan movement in our current context. Cherry picking what we like about other churches is appealing at first, but problematic in the long run. 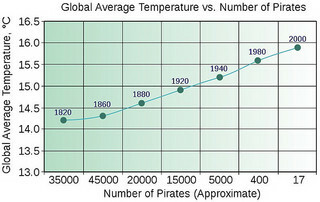 “Global Warming is Caused By Decrease in Pirates.” ©2011 Copyright John “Pathfinder” Lester. Licensed Under Creative Commons. I agree with your point about discerning causation. Does that throw into question the Towers-Watson research about the “drivers” that bring about effective, vital congregations? It seems like that study operated on a similar correlative approach (i.e., what common factors exist in vital congregations). Thank you for the comment. I think it does call into question “drivers” unless the research can go beyond a correlation. This is an extremely good point. It applies not only to Talbert Davis’ post but also to the Call To Action team’s Tower Watson Report and Robert Schnase’s highly regarded Five Practices of Fruitful Congregations. In fact, I would say that Schnase gets the causation exactly backwards. Spirit filled congregations are fruitful and they exhibit the fruits of the Spirit. However, a strong focus on striving to produce the fruits of the Spirit in our strength does nothing to actually produce Spirit filled congregations. I agree. I think Schnase gets the causation backwards too. A tree is different than the fruit. We can use the fruit to gauge the health of the tree, but we need to think about what does a healthy tree look like. Previous Previous post: Failure or Faith?